Despite his narrow loss in the 2014 Hansa Fish River Canoe Marathon to world champ Hank McGregor there is no revenge in the eyes of 2015 K2 champion Andy Birkett who has been taking some time off following a busy overseas marathon campaign in the build up to the 2016 edition from 7-8 October. 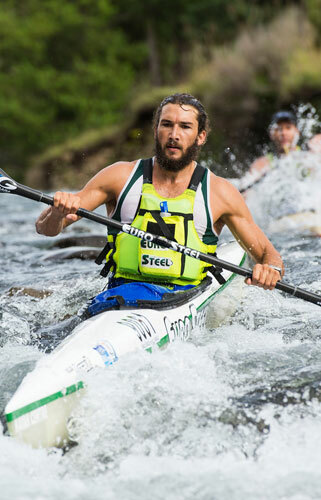 The 2016 event doubles up as the South African K1 River Marathon Championships which might add a little more spice to the contest at the sharp end of the field but winning the overall race and the national title is not at the top of the priorities list for the Euro Steel star. “To be honest I want to get to Cradock and have a great time catching up with my mates over a braai and enjoying the atmosphere around the race,” Birkett said from his holiday venue in Plettenberg Bay. “It has been a really long season for me having just come back from a race in Slovakia after the Marathon World Championships so I have taken a few days off from training. “We did a training session on Thursday and it felt good to be back in the boat, I haven’t lost the desire to train even after such a long season, which is good. “River marathon racing is completely different in many ways but no more than the boat being different so I had to get used to my river boat after only paddling in a flat-water marathon boat for so long. “It was great to be in my river boat again but our training session was interrupted by a bit of cliff jumping!” he mentioned light heartedly. Birkett’s duel with McGregor in 2014 was one for the ages as the race came down to the final sprint for the line into Cradock and with Birkett finishing as a runner-up to McGregor in the K1 race at the recent marathon world championships he still feels that McGregor isn’t the only threat in the men’s race. “There is another really strong field assembled this year for Fish and it is great to see the likes of Kiko Vega come out from Spain to race – I think he is going to be a top contender. “Jakub Adam is always a tough customer and will be challenging for a podium as well as Jasper Mocké, Greg Louw, Louis Hattingh and Jean van der Westhuysen. “Jean was incredibly strong at the marathon race in Slovakia recently where he beat the Hungarian Under 23 World Champion so I have a feeling he is going to surprise a few people at Fish!” added Birkett. With a silver and bronze medal to his name at the world marathon championships Birkett’s season was geared around the international flatwater spectacle that took place in Germany and with a few days off now he is looking forward to a longer break post-Fish. “I am going to be taking a few weeks off after Fish as the season has been really intense and I need an extended time away from paddling to recharge before we head into the next phase with the KZN river season. “It has been a good season and I am looking forward to finishing it off at Fish, it is a great race and one that I love coming back to every year. “Catching up with old friends and enjoying the event from a social point of view makes it really appealing to me and I am looking forward to the short trip from Plett to Cradock next week for the race,” a relaxed Birkett added.